WRITTEN BY & PHOTOS BY MIKE PRINS. Tuyambaze is a young Rwandan boy with big dreams. His shirt is a little tattered and his pants are a little dirty but his smile is brighter than ever. Tuyambaze is the proud caretaker of his father's rapidly growing herd of pigs, thanks to the many Canadian supporters of the Food for the Hungry (FH) Gift Guide. And it started with one pig. 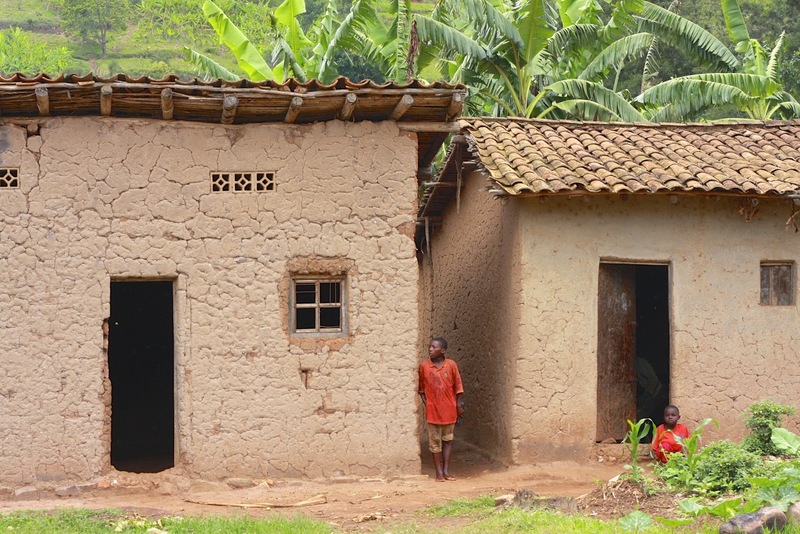 Tuyambaze lives in the community of Busekera, Rwanda. His family's home is nestled in a cluster of houses near the FH farming and seed distribution centre, just down the road from the Busekera Primary school. 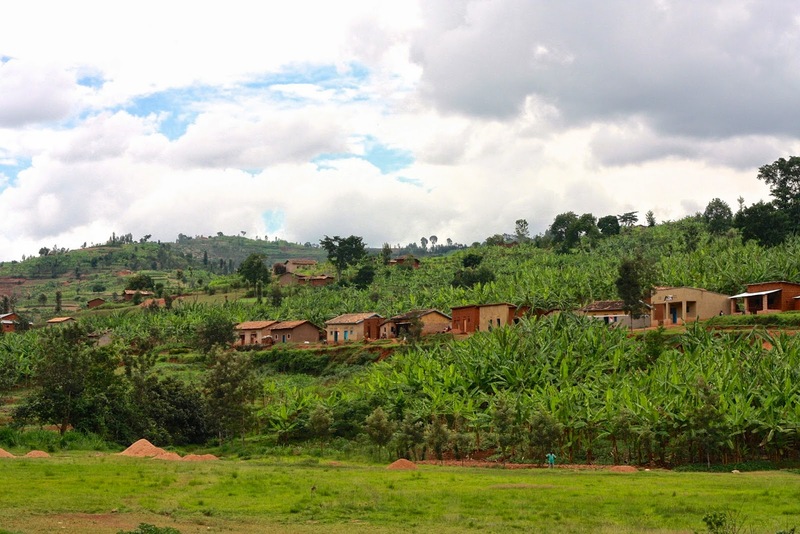 It's a quiet and lush collection of hilltops and shallow valleys whose families came together with FH in 2011 to combat the poverty that its residents struggle with. To farming families like Tuyambaze's, a pig is more than just a snorting pet - it's a big step forward towards sustainability. Though shy, Tuyambaze is excited to show off the family pig. All it took was a gentle suggestion. As he walks up to the enclosure he and his father built behind their humble mud home, the sow greets Tuyambaze with a snort and six piglets scampering around. When a visitor tries to pick up one of the piglets however, loud screeches erupt from the protective mother. While the piglet-snatching perpetrator panicks and quickly returns the piglet to mom, the rest of the group erupts into laughter. 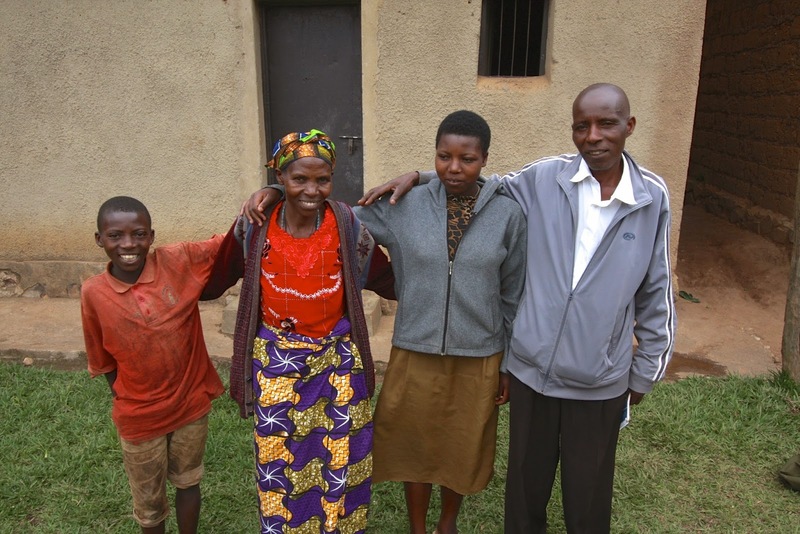 Tuyambze's father, Urezweneza, is the head of the Parent Teacher Association and the happy recipient of their initial sow (thanks to support from the FH Gift Guide). 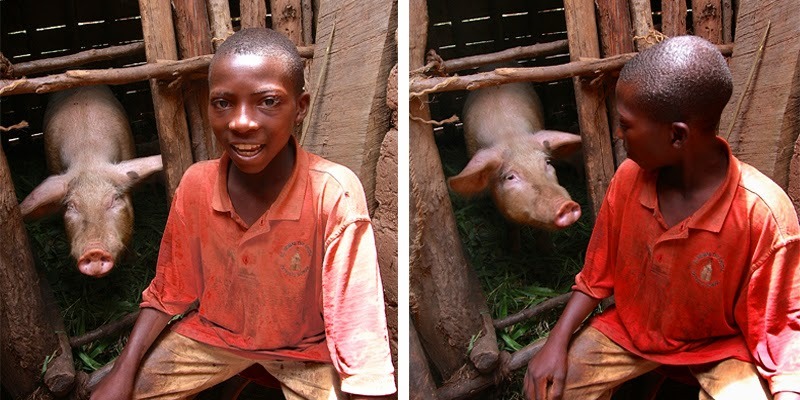 As part of an FH animal husbandry program, he was able to get his first pig free of charge. 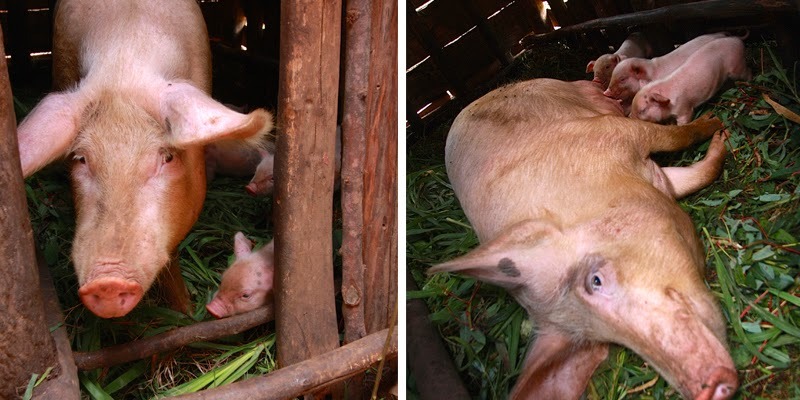 One thing led to another, and now his sow is the mother of six adorable piglets. Included in the gift of the pig was training on how to build a proper shelter, and how to feed the pig well and prevent her and its young from getting sick. It is critical to keep this investment safe and healthy and the ongoing training and support continues to be well received by the community. 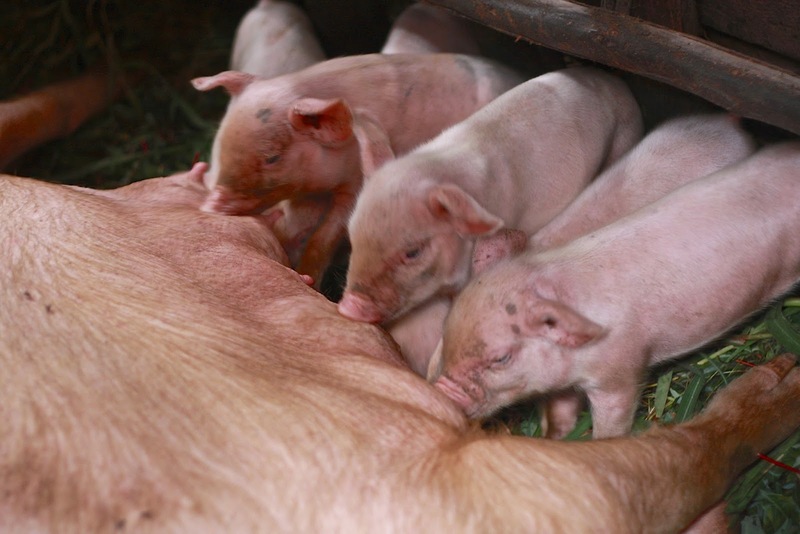 Did you know that one pig can have up to two litters of piglets each year, giving birth to 6-12 babies every time? That's up to 24 piglets in one year! Imagine how quickly a small-hold farmer could build capital by raising and selling pigs. Not only that, pigs are prolific poopers, to say the least. It's not a glamourous job, but the manure Tuyambaze cleans out of the pig pen goes straight into their family garden and small cluster of banana trees behind the house. It's made a big difference in their family's nutrition - in fact, Tuyambaze's father points out his son is nearly as tall as his dad now. "I'm so proud to own this pig!" Tuyambaze's father exclaims, grinning. "From this one pig, I can gather manure to make organic fertilizer for our family garden so that we can eat fresh and nutritious vegetables and beans. From this one pig, I can sell many piglets to create wealth for my family. From this one pig, I can have the money to send my son to school. From this one pig, I can create an entire herd! I am very happy with this pig." Part of the FH animal husbandry program is "giving back". From the first litter of piglets, Tuyambaze's family agrees to give one piglet to the FH distribution centre to be passed along to another family in need. It's a highlight for Tuyambaze's family; they know firsthand the impact one pig can bring and are thrilled to pass that onto a neighbour. In addition, a second piglet goes to the owner of the boar that fathered the litter. The remainder of piglets, however, belong to Tuyambaze's family. 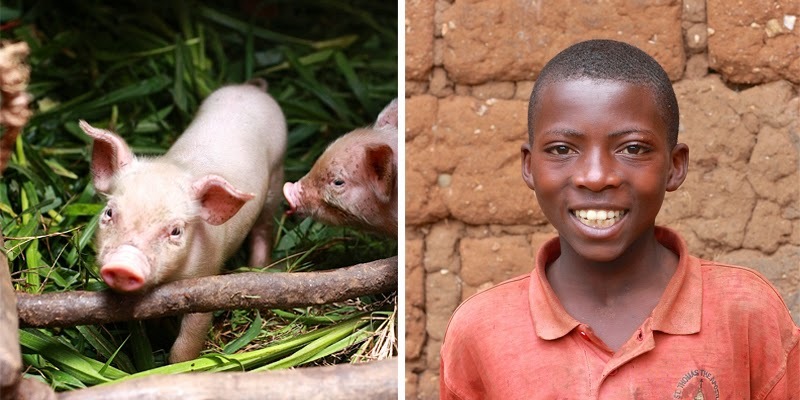 A big thank you goes out to all the Gift Guide shoppers who purchased a pair of pigs and generously changed the lives of hundreds of boys like Tuyambaze!